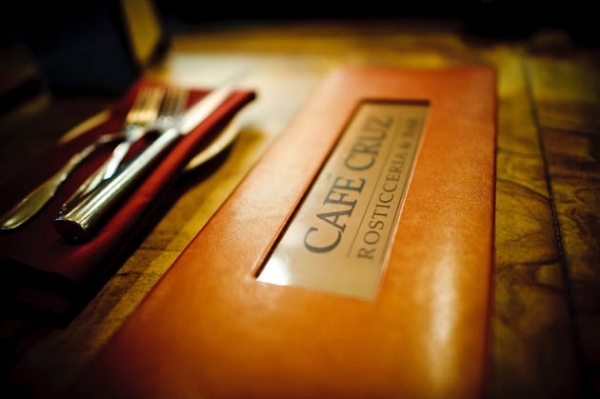 Established in 1995, Café Cruz has been a favorite dining place for area residents and out-of-towners for 22 years. Its atmosphere, menu selections and friendly staff are an ideal combination for enjoying a casual meal or celebrating a special occasion. The restaurant offers something extra for every event. The interior décor was designed to offer an open, festive and casual atmosphere. Guests appreciate white tablecloth service in the spacious dining room. A classic French made Rotisol rotisserie is in full view featuring natural meats and poultry. Chefs can be seen working their magic in the open copper-backed kitchen. The murals depicting local scenes are the work of local artist Terry Wells. Visitors enjoy cocktails and appetizers in our bar featuring a distinctive adobe-style fireplace (the creation of artist/contractor Shan Gilmore). In keeping with our eco-friendly philosophy, the wood tables and custom bar top are made from sustainable hard woods. For those who prefer open air dining, Cafe Cruz's heated patio is just the thing. The focal point of the patio is the beautiful Tuscan fireplace, surrounded by greenery and flowers. Our cozy fire-table is a fun place to gather for cocktails. For banquets and other special occasions, the lush garden room with its distinctive waterfall fountain is an ideal choice. 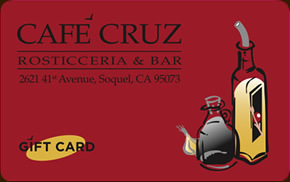 Cafe Cruz began in 1995 as a partnership between Chef Steve Wilson, and Jerry Neilsen, former proprietor of the popular Grapesteak Restaurant (which was located in the building Cafe Cruz now occupies). Their combined vision created a lively and fun restaurant, featuring food using fresh, high quality ingredients. Steve's experience and love of cooking originated in Pennsylvania, Monterey and Santa Cruz establishments where he worked his way up in the culinary world. In 2008, Jerry retired from the restaurant business and was bought out by Steve and his wife, Nikki Howe, to continue the tradition of creating fun and memorable dining experiences at Cafe Cruz.